Often used for vehicle art work or window displays, cut vinyl can be a great, affordable way to advertise. There are a ton of different uses for vinyl decals and lettering, and typically the application of cut vinyl is as simple as peeling off the back of a sticker. The cut vinyl stickers available from PrintPrint are adhesive-backed, and can also be printed to be facing inside-out for see-through surfaces or glass, or outside-in, for walls and other solid surfaces. Here, we take a more in-depth look at how cut vinyl can benefit you or your business. A great use for cut vinyl stickers is mobile advertising, which will help to take your business’ vision on the road. Mobile advertising can be as simple or complex as you want it to be. If you’ve got a fleet of vehicles at your disposal, you may want to use vinyl stickers to display the address and phone number of your business, or create a unique, eye-catching design that can make them really stand out. At PrintPrint we can create cut vinyl designs and stickers of nearly any shape and size. If you’re considering a vehicle wrap it’s important to speak to one of the customer service reps at PrintPrint to determine whether your design will work with cut vinyl, or if you need a specialized car wrap material; we offer both. Whether you own a large factory or a small boutique, your storefront is arguably one of the most important places of your business; it’s where you greet customers and have the chance to show them what you’re all about. A cut vinyl sign or lettering, is an easy, affordable way to decorate your property. You can design something eye-catching and unique or use simple lettering for a more classic look. The best thing about using vinyl stickers for your storefront is that they’re easy to apply and come in virtually any design or lettering style you want. Additionally, having the option of reversed lettering to stick on the inside of your storefront window makes your sign less susceptible to wear and tear. Another great use for cut vinyl stickers is for promotional purposes. Handing out free stickers at events, or making them available in different promotional settings is a great way to get the name of your business out there, and the cooler your sticker design, the more likely potential clients will remember you. Even if the sticker winds up on the fridge or someone’s bumper, just having your logo in front of people can help increase your customer base. Using cut vinyl for your product can be an inexpensive way to brand the consumer goods your company creates, and display your logo and any other valuable information related to your product. 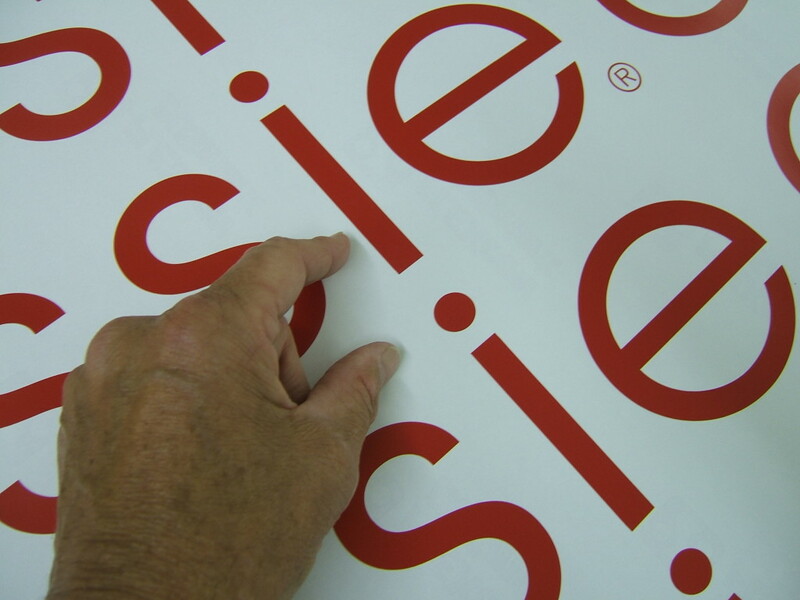 Unlike digitally printing a logo onto your product, which can often scratch off or deteriorate over time, vinyl stickers adhere to the surface and can last much longer. Whether you have a company that makes water bottles for sports teams or custom watercrafts, vinyl stickers are a great way to decorate and brand your products without breaking the bank. If you are considering using vinyl stickers for products be sure to consult with one of our customer service reps to make sure you use the right material. For example, cut vinyl wouldn’t work well for water bottles, but printed vinyl will, so be sure to be specific so we can help you find the perfect sticker options for your product. We also do stickers for walls, floors, and even concrete. One of the biggest reasons why many choose cut vinyl designs or lettering over other options for their storefront is because of its fast and easy application. You can still get a classic, professional look without waiting hours for paint to dry, or extensive construction. 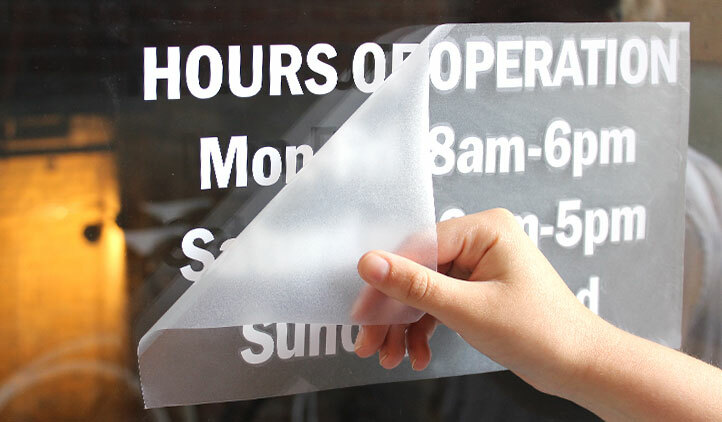 Also, using cut vinyl is a great way to cut down on labor costs and gives you an easy DIY alternative to decorating your storefront. Some types of paints can release harmful chemicals into the air known as volatile organized compounds (VOC), which are usually created by highly pressurized paints. If you want to avoid releasing anything into the atmosphere, then using cut vinyl lettering is one sure way to do this. If you want a storefront that is free of errors, then cut vinyl lettering or designs is the perfect thing for you. Unlike a hand-painted storefront, vinyl lettering is a way to make sure every letter and part of your display is perfect, created with 100 percent accuracy before being printed. Another benefit to using cut vinyl is that it’s easily replaceable and won’t lessen resale value if you’re planning to apply it to a vehicle or building. 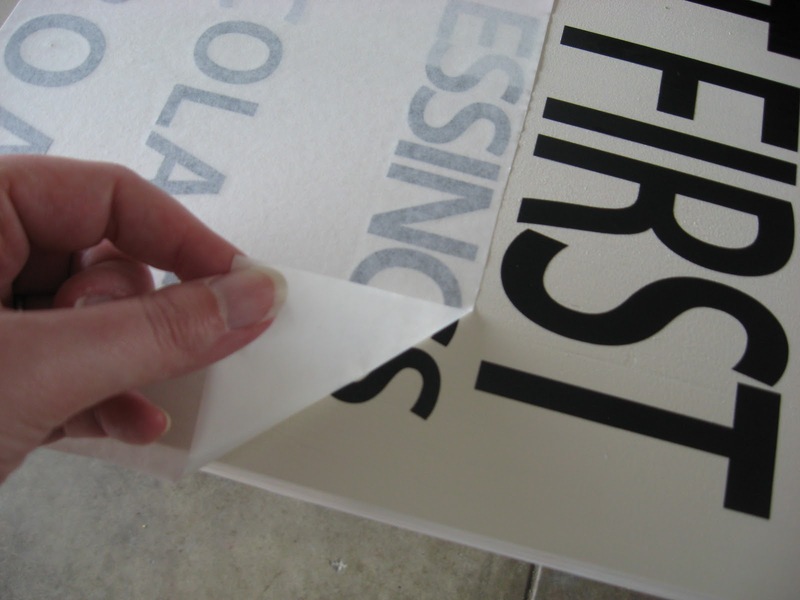 You can use cut vinyl for nearly anything you can think of, from advertising, to logos, to displays. One of the great things about vinyl is that it can be used to create any image or lettering you want, and PrintPrint will work side-by-side with you to settle on the perfect design for your storefront, or logo for your company. To learn more about our services and the possibilities of using cut vinyl for your next project, be sure to check out our website.